National Farmer’s Market Week – Take Time to Buy Local! Does anything taste better than corn on the cob or a tomato fresh from the garden? Many of us don’t have the space or time to grow our own but the next best thing may be visiting your local farmer’s market. The Secretary of the U.S. Department of Agriculture, Thomas J. Vilsack has proclaimed the week of August 4-10, 2013 as National Farmers Market Week. This proclamation encourages the people of the United States to visit a farmers market and to increase awareness of the many important contributions farmers make to daily life in America. • Take cash with you in case they don’t accept debit or credit cards. • Bring your reusable grocery bag to reduce the environmental impact of plastic bags. • Take a cooler with you to refrigerate produce if you won’t be going home after your market visit. • Find out if the market is pet friendly before you take your pet with you. Buying local is good for many reasons. • Local foods are good for your health. • Local foods are good for your wallet. • Local foods are good for your community. • Local foods are good for your taste buds. While visiting your local market, ask the grower if they grew the produce themselves. Some markets have policies about the food being grown by the farmer while others allow vendors to purchase produce to sell. See if the Farmer’s Market has a website or Facebook page. 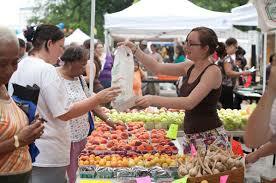 A visit to their website or page will tell you which vendors will be at the market. You might also want to check out what produce is in season and search for some recipes that will incorporate that produce. This weekend at our local market, I picked up fresh peaches, sweet corn, baby cucumbers and black berries. What a great way to support your local farmers and enjoy the harvest of the summer. Go green, go local and enjoy the fresh flavors!